"As long as I have my trusty cap, I'll always be the NL Cy Young Award winner." After pitching seven scoreless innings on Monday en route to his first win of the season, 2-time Cy Young award winner Tim Lincecum let the sports world in on a smelly little secret: he's worn the same baseball cap for all 91 of his major-league games. "If I had one superstition, it would be this guy," said Lincecum of his cap. This is not the first time the Giants ace has adorned a scrap-cap; the 25-year-old's superstition dates back to his youth. "In high school, I got a cap and I stuck with it all year. In college, I wore the same hat until I had to change hats because they changed brands. I like keeping the old hat. I like the worn look. Plus, it means something to me. I don't want to throw it away," said Lincecum. Under normal circumstances we'd find this bizarre, but after watching reliever Turk Wendell brush his teeth after each inning pitched, nothing surprises us anymore. Lincecum's hat has never been washed, but according to a reporter who sniffed it, the cap doesn't reek of 605.2 lifetime innings. That answers our first question, but we have some other burning questions we're dying to get answered. 1. 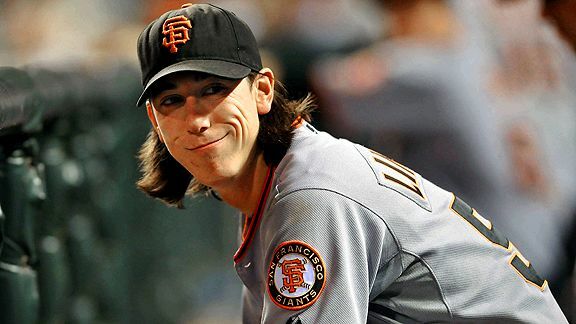 What kind of pressure does this put on Lincecum's shampoo to keep those beautiful brown locks smelling fresh? And what brand is able to rise up to such a challenge? 2. Is it Tim's mythical cap or his snuggie that's responsible for his wizard-like performances? 3. If Lincecum continues to grow his hair, will it eventually sprout through this four-year-old cap creating a visor-do? 4. Since he takes his cap home during the offseason, does he dress up as Tim Lincecum for Halloween? 5. What products are used to preserve the cap? Does he use a natural mixture of fruits and berries or does he opt for household products like mothballs and Febreze? 6. Does he save his special hat for game day performances and wear an alternate cap when he's just hanging out in the dugout? 7. What happens when the Giants do the whole alternative uniform thing? Is Bruce Bochy forced to juggle his staff or does Tiny Tim come up with a "mysterious" illness?